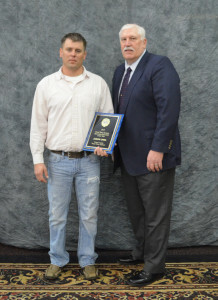 The South Dakota Association of Rural Water Systems (SDARWS) recently named Tripp County WUD System Operations Specialist Jason Orel as the top Rural Water System Operations Specialist during the organization’s Annual Technical Conference in Pierre. Class I Wastewater Collection, and Class I Stabilization Pond. Orel was born and raised in Winner. He was very active in many sports throughout his school years, but excelled in wrestling. He was a three time state wrestling runner-up and graduated from Winner High School in May 2003. Tripp County Water Users District is located in Winner and serves the counties of Tripp, Gregory, portions of Lyman, Mellette and Todd, individually serves the towns of Witten, Wood, Herrick, Fairfax, and St. Charles, and bulk serves the towns of Colome, Dallas, Burke, Bonesteel, six Native American communities. The South Dakota Rural Water Annual Technical Conference in Pierre annually hosts over 450 individuals and provides water and wastewater educational presentations for board members, managers, and operations specialists from throughout South Dakota. PIERRE, S.D. – GED Testing Services (GEDTS) has announced a recalibration to the GED Test passing score and the addition of two new performance levels. The passing score for high school equivalency is moving from 150 to 145. The program will also include two optional levels above high school equivalency to signify college readiness. South Dakota will retroactively apply the new performance levels to test-takers who have tested since Jan. 1, 2014. Students who earn scores between 145-149 prior to the new passing score will be eligible for this high school equivalency credential. In addition to the 545 South Dakota students who earned a credential since Jan. 1, 2014, an estimated additional 78 will be awarded the credential due to the change in cut score. GEDTS will notify affected students. All students can expect to see their updated scores and information in their MyGED account on March 1. The scoring enhancement is a result of detailed analysis of educational outcomes of GED program graduates compared to high school graduates over the past 18 months. The outcomes data show GED graduates are performing as well as, and in many instances outperforming, high school graduates in terms of not needing remediation when entering postsecondary programs. PIERRE — With just 20 members in the Legislature—eight in the Senate and 12 in the House—Democrats face constant rejection of the bills they offer. However, being a super-minority can have its benefits said Democratic legislative leaders when they spoke to publishers, editors and reporters at South Dakota Newspaper Association’s Newspaper Day on Thursday. House Minority Leader Spencer Hawley, D-Brookings, said Democratic legislators needed to make their decision to run for re-election during the session rather than after. “We literally are totally beat down” by the end of the session, Hawley said. “Even as a super-minority, we have had a huge impact on South Dakota,” said Senate Minority Leader Billie Sutton, Burke. Sutton noted Democratic support for successful initiated measures in recent elections, including the boost in the state’s minimum wage. He said bills brought by Democrats are routinely defeated, only to return in a slightly different form at a later session as a Republican-sponsored bill. “I’m fine with that,” Sutton said, as long as good bills are working their way through the Legislature. Sutton pointed to the ongoing discussion in the current legislative session about Gov. Dennis Daugaard’s proposed half-cent sales tax increase as a funding source to raise teacher pay. Hawley noted how happy Democrats are to be talking about education funding and the governor’s plan to increase Medicaid. “We probably agree on more of it than his own party does,” Hawley said. Political parties in the Legislature traditionally caucus so leaders can direct members on how they want them to vote on certain legislation. South Dakota’s Democrats caucus, but the leaders don’t try to sway their members, according to Hawley. “We end our caucus with ‘vote your conscience,’” Hawley said. Bringing the Democratic Party out of super minority status may rely on a constitutional amendment that will be on the 2016 ballot. The measure would take redistricting of legislative districts away from the Legislature and give it to a special commission. Hawley said the general public should choose how the districts are formed rather than allowing the Legislature to do it. He said this results in legislators choosing their own districts. Dayna Diez of Winner has been named to the fall semester dean’s list at the University of Sioux Falls. She is a senior majoring in nursing. Haley DeMers of Winner was also named to the dean’s list at USF. She is also a nursing major.